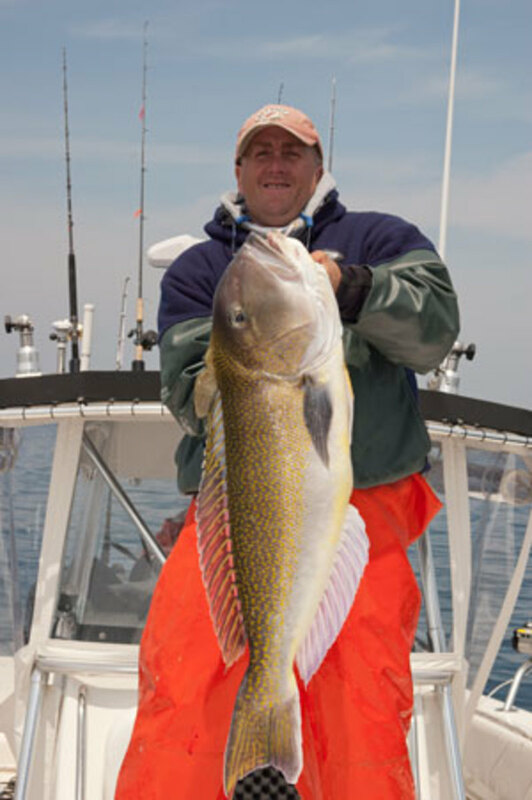 Golden tilefish are brawny, colorful bottom dwellers found from Southern New England to Florida. 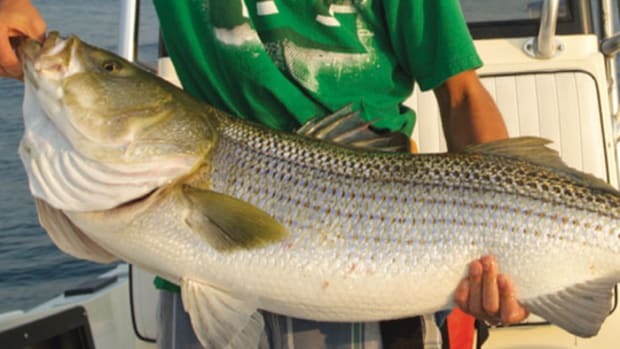 These fish generally tip the scales at 5 to 25 pounds but can grow to 60. They inhabit a specific depth range, usually between 450 and 700 feet, which accommodates their limited water-temperature preference of 50 degrees. Their unusual lifestyle requires a specific type of bottom composition called Pleistocene clay, which allows the fish to dig the burrows they live in without having them collapse. Keep this in mind, it’s important. 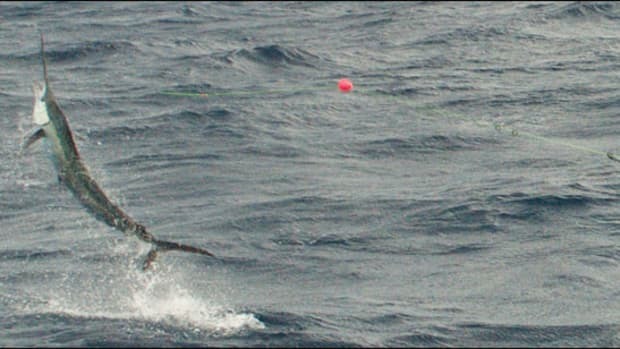 Off the Mid-Atlantic states those conditions occur around submarine canyon edges, which have made dropping for tilefish a great add-on to offshore trips for tuna and marlin. 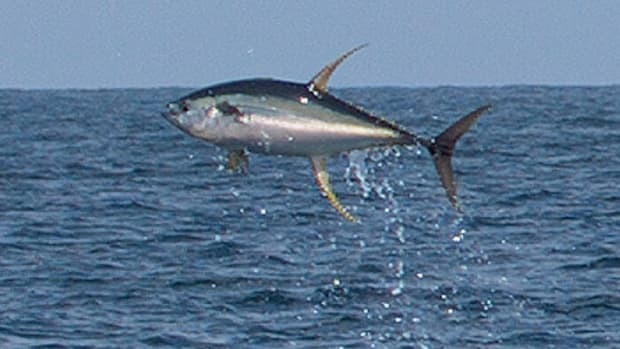 If you know a little about these critters you can make a few stops and come home with some tasty fillets for the dinner table. Oh, did I mention they’re a delicacy? Capt. 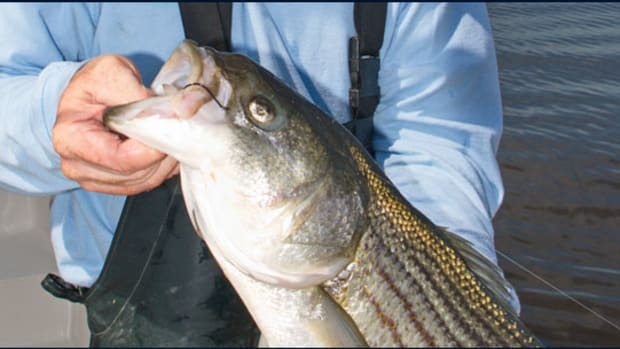 Tim Tanghare of Clean Sweep Charters, based in Cape May, New Jersey, has an enviable reputation as a fish producer—whether you are talking striped bass, bluefin tuna, or bottom fish—and has been on the cutting edge of catching tilefish for the last 15 years. 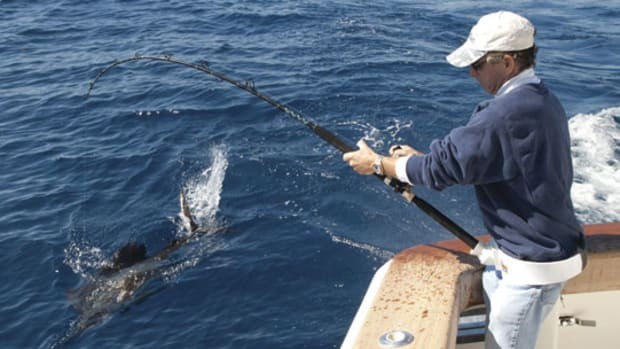 I was fishing with Tim in 2005 when I caught a 55-pound golden that broke the longstanding IGFA All-Tackle World Record, and which was promptly beaten by a pound a month later. Tim offered some great advice for targeting these not-so-elusive fish that can help put you on ’em too, so listen up. 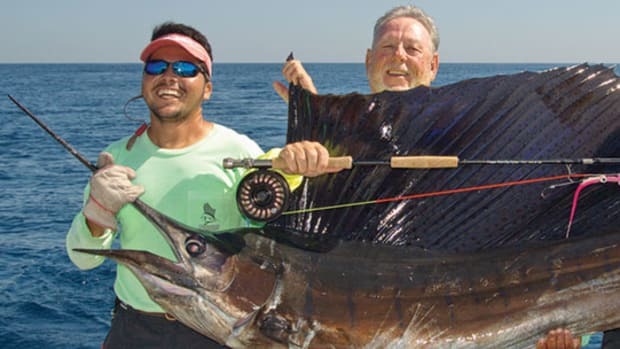 While you may be thinking electric reels and super heavy sinkers, Tim recommends midsize, high-speed conventional reels, such as 30-pound class, loaded with 65-pound braid and mounted on stout 7-foot rods. Most of the time he uses 16 to 24 ounces of lead and a simple bottom rig with two 6/0 or 8/0 circle hooks. 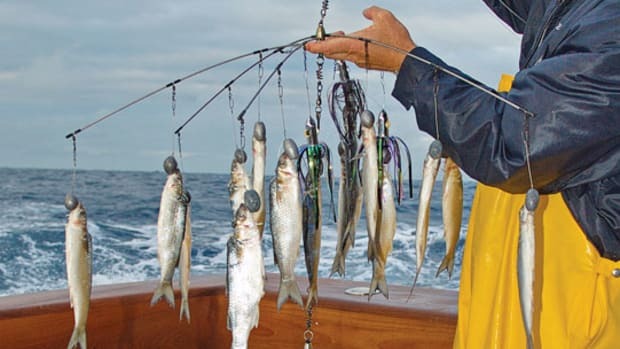 Bait can consist of strips of mackerel or pretty much any fish in addition to shrimp, crabs, or clams—anything that lives near the bottom. Fish strips tend to catch larger tilefish and if you can get your hands on some fresh ling (red hake), watch out! Tim stops to catch ling in 100 to 200 feet of water before heading farther offshore for tiles. 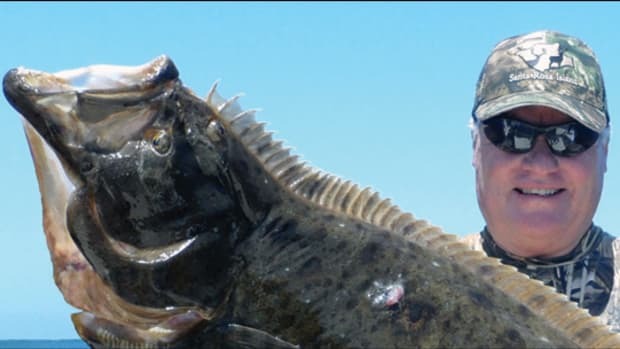 “I start looking for tilefish in areas near the canyon edges that have a marked downward slope, which tends to expose clay substrate beneath sand or gravel,” Tim advises. “No clay, no tilefish. Sometimes you will mark what looks like rocks on your depthfinder, but they can be clay formations and goldens love ’em. When you catch tiles make note of what the bottom looks like on screen, since the color your fishfinder associates with the bottom there can translate into finding other areas of similar bottom composition. 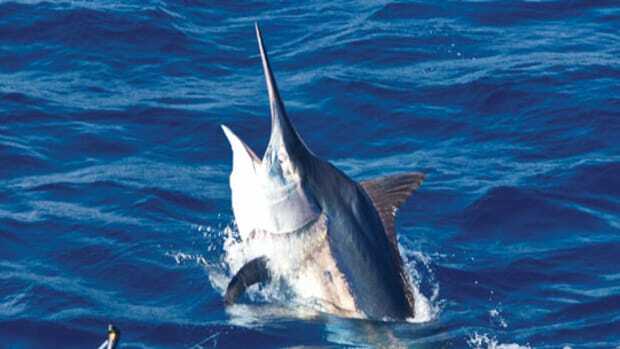 About now you’re probably wondering how Tim can fish so deep with so little lead. The answer in a nutshell is by “hovering.” When you find a likely area you want a very, very slow drift, but breezes and currents offshore can make that difficult. That’s where a skilled, observant hand at the helm comes into play. By using the engines to stem the current you can hover over an area allowing the anglers to hold bottom with light tackle and a modest amount of weight. And man … do tilefish put up a fight on that tackle. The first run of a good-size golden is a rush to its den and you’d better be able to put the brakes on—another reason to bring your no-stretch braid. They fight very much like grouper, slugging it out, taking line, and bouncing the rod hard. Once you get them up 250 or 300 feet they inflate and the fight slows as they begin to float toward the surface.